I'm waiting for a price drop, and then I'll probably bite. There are some good deals for the R body and R kit, but I'm waiting for it drop a little more. Really, the main reason to get the R is to use the RF lenses. I'm also waiting for RRS to make the L-bracket for the R (not currently in stock). I finally played with the R and RF 24-105, and it was better than I thought. Single shot focus accuracy is great and better than my 5D4 with off center focus points. It's like every point is a center point. And this was with f/1.4 lenses and putting the subject into the corners. I would get this to replace my 5D3, which is currently backing up the 5D4. But without a faster frame rate, GPS, etc., the 5D4 will still be the primary. I don't understand why people hem and haw about the missing joystick. With 5000+ focus points, the joystick isn't fast enough. Maybe if they had it skip 10/20 points at a time and then if you push it in it moves 1 point at a time would make it usable. I’ll be honest, I want that new 50. If I could mount it on my 5D4, I’d have one right now. I was never truly happy with the EF version. I find myself frequently disagreeing with DPR assessments, but I think they've improved markedly in the past year or so. Here's what I think is going on: you have different people who do different types of photography, AND they have different preferences and priorities. The DPR guys will typically tote a camera around a city and take pictures of people and architecture, reveling in the ability to underexpose to preserve highlights and bring up shadows in post, valuing ISO invariance. This is a real and legitimate use case, but it's pretty far off from capturing an osprey snagging a fish, or a college football game play (more my speed). A camera review from someone valuing the former is going to be very different from one valuing the latter. What I appreciate a great deal is that the DPR reviews have tended to be more clear about what they value and why. You get a sense from the review itself what they're concentrating on, and what they like and don't like relative to what they're trying to do. This is a missing piece that I feel was done less in years past, where the final rating was more mysterious. I may still disagree with it now, but I think it is better rationalized, and I can determine more easily if this rating is going to apply to my use case. I think DPR could vastly improve its reader service by having the multiple people it has test its cameras divvied up into different types of genre priorities and have them come out with ratings weighted to those priorities. So the (five) street photogs might rate the R as a 72 on average, the (three) studio-oriented photogs a 76 and the (zero; maybe add one or two?) wildlife photogs a whatever. As a wildlife guy, the R's 3 fps in AF servo may well warrant a score less than what DPR gave it. To be fair DPR have been drip-feeding their results for months now, so it's hardly a surprise. It was pretty much obvious from the launch that they disliked some of the ergonomics, and seemed almost morally offended by the 4k video treatment. The score is very much based on spec comparisons, especially with Sony, but also apparently affected by the Z7 review. But, as others have said, they seem to be comparing the EOS R to upmarket (and spec) versions of Sony or Nikon bodies. I agree with your reasoning here. What I find most idiotic with DPR is that final score. It is so utterly stupid to sum up the qualities of a camera in one score, because a camera can be perfect for one user, and insufficient for another, based on the actual needs the user have. I couldn’t care less about 4K crop. If anything, I would much rather have good 1080P video than perfect 4K. How does fantastic 1080P and crappy/no 4K play out in the magic final DPR/DXO score? I don’t need a deep buffer, or high frame rate. Why should such qualities matter in one final score? DPR covers a lot of pros and cons in their reviews, and are informative, but they ruin their credibility by the final score. They would be much better of if they had a conclusion based on “who is this camera for”, and who is it not for. They would be much better of if they had a conclusion based on “who is this camera for”, and who is it not for. they do provide exactly that. You can safely ignore the % score. But it is a fairly good approximation of how much bang for the buck a camera delivers OVERALL vs. its competitors in same class. The % score overshadow other conclusions, because it leads to cameras and features that may not be needed. theoretically. if DPR (or DXO) were the sole relevant source of camera reviews. they are not. in practice each review is one source amongst many to help us assess different imaging product's specs, capabilities, functionality, performance, absolute and relative strengths and weaknesses. "no IBIS" (working in tandem with in-lens stabilization when present) for example is an indisputable absolute and relative weakness of EOS R. only the amount of relevance and usefulness for individual potential customers differs, depending on their respective use cases and preferences. current price of EOS R in absolute terms (€, $, ... ) and relative to competitive products is both an absolute (how many people interested can afford it!) and relative weakness, which may be mutigated for existing Canon customers due to "ecosystem advantages" from Canon lenses (EF, EF-S) and other accessories (eg compatible speedlites) already in their possession. nevertheless those factors are no strengths, but weaknesses of EOS R and the more sources and voices point them out (since Canon marketing materials will not), the better for us customers. Canon may decide to eliminate or mitigate them in succeeding products and/or via firmware updates (if possible) and/or by lowering price. i therefore welcome the critical DPR review, as well as any others, provided they are independent and not done by fan boys or shills (of Canon or other brands). that said, i wonder, what % score my desired "stills only" camera would fetch from DPR ... no video recording whatsoever. only stills. it should not be able to get a score of more than 1% relative to any other FF MILC on the market, right? My point exactly. And the Leica is crazy expensive, and doesn’t have IBIS or AF either. It must be one of the worst cameras you can buy. Camera may be 79%, but that night, the photographer was 100% because the camera held deliver the winning image to the client. To me, that night, the R was a winner. No second slot or uncropped 4K. point is: the client doesn't care about that. Just the image. Its easy to make fun leicas, until being in the hands of a skills photographer. IF leica created an EVF like one in the SL, or even the one on the R, I'd pick one up yesterday. yes. Leica M10-D sure is. Even when money is no object it would be a stupid purchase. Just for the record, I was beeing sarcastic. I wish I had a Leica, and I might very well end up buying one. I tried to make a point related to DPRs score system. If DPR were to use the same criterias on a Leica as they do on the EOS R, every Leica ever built would get a "disaster" score, for not providing AF, video features, IBIS etc. And of course, that score would be useless for anybody looking to buy a Leica camera. My point is that the score they give a camera can be very misleading, if the camera buyer has other priorities, than those DPR use in their rating system. only Leica manual focus lenses are compact. SL stuff with AF is huge, bigger than most other mirrorfree FF lenses with [superior to Leica] AF. Personally I will never understand why people are willing to spend lots of money for mere "status symbol" products. Expensive items like Ferraris are at least very competent and fast cars second to none, far outperforming a Toyota Tercel. But Leica cameras are antiquated, sub-par devices, functionally outperformed and outclassed by virtually any recent "Toyota Tercel-class" run-of the mill product by Canon, Nikon, Sony. I also think it applies to those old shard Leica lenses and that they are also significantly outdone by recent Canon [L] glass - both EF and RF. 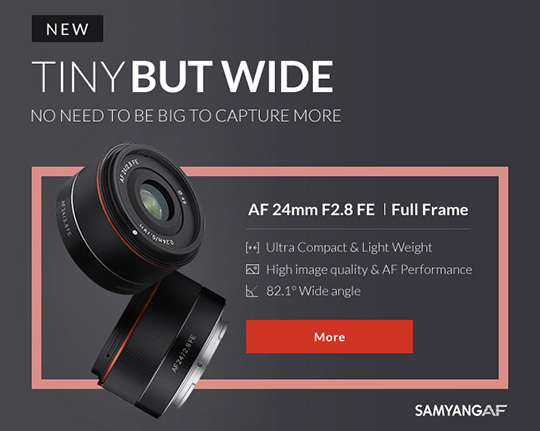 Those recent Samyang AF lenses 14/2.8, 24/2.8, 35/2.8 [for Sony FE] but also AF 85/1.4 [for Canon EF] are much more along my idea of lenses ... and I hope they can be made even more compact for Canon RF mount (and Nikon Z) than for "less than ideal" Sony E-mount. And I am willing to pay 50% more if they come from Canon themselves, rather than with reverse-engineered AF and mount protocol. The "magic number" final score has been important in establishing the DPR internet brand. Brilliant click bait. DPR does magic numbers and discovery of killer features very well--DR, dual card slots, and IBIS being examples. I do think that DPR has moved toward fairer presentation of the pros and cons of specific cameras. there is no really meaningful "single number"/ranking for anything. It all depends which rating dimensions and criteria are used. Re. EOS R: Canon made a mistake by placing it "in the middle". Nikon and Sony approach with higher end + lower end models in parallel works better. EOS R with sensor and specs "as is" should really have been clearly positioned by Canon as capable entry-level, "6D class" FF MILC and - even more importantly - been priced accordingly. USD/€ 1799 "including free EF adapter" at launch would have given EOS R a much better start vs. Sony A7 III and Z6. Plus ideally parallel launch of a high specs, hi-rez model [mirrorfree "5DSR II"], targeted directly at Nikon Z7 and Sony A7R III. RF lens starting lineup would also have made a lot more sense that way. But ... stupid Canon ... apparently was not able to deliver yet on the higher end body. May be a little early to pick winners and losers. yes. I do expect Canon to still come out ahead of the game at the end of the day. Just saying "they could have made it easier for themselves and a lot harder for their competition".